Rachel and myself had carefully planned a naturist friendly cycling tour through Europe and Le Perron near Malmedy which was on route seemed too good a place to miss. Once we got going we quickly arrived at Le Perron where checking in was easy and we met the lovely Liliane and her partner . We were shown to our accommodation which was more than we could have imagined, the view was superb, the pod warm, clean and equipped with all the essentials. All we had to do was strip off and enjoy the site. In the evening we had the chance to use the sauna and then spent a very enjoyable time sat round a log burner in the main lounge chatting to visitors and staff. For us this was the reason we had chosen to go on a naturist cycling trip, meeting new people, chatting about past trips and adventures to come, all with a drink in one hand. Our time at Le Perron went too fast and we have made a mental note to come back for a much longer time next time we are in a Belgium. 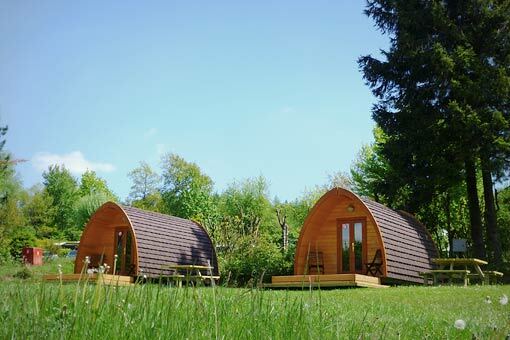 We have found a gem of a naturist site, with everything you need for a well earned rest. Lastly we can not thank our hosts enough, they make the site and for us a break we won’t forget. We were cycling through Belgium and stopped at Le Perron for two nights. We can not praise the staff, accommodation and cleanliness high enough. Nothing was too much trouble and we really enjoyed our brief stay. The highlights were sitting round the log fire chatting with fellow campers after a rejuvenating sauna. Our hosts Lilian and Paul are a wonderful example of caring for their guests. Thank you so much. Lots of indoor and outdoor games for the kids and a nicely heated outdoor swimming pool - which we were in most of the time! Also the surrounding countryside is lush and green with enough areas to explore for a year. We visited some lovely places, including the nearby resort town of Spa, impressive Coo water falls, and well presented museum of WW II conflict in The Ardennes. Further afield we visited the Mosel Valley in Germany and Luxembourg (brilliant good value wines), Trier and Aachen - all magnificent sites for the family to enjoy. What is your experience with "Le Perron (Athena)"? How do you rate Le Perron (Athena) in general?